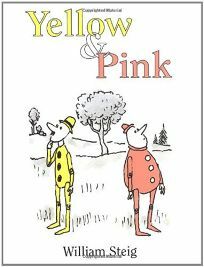 A pair of wooden puppets, one lean and yellow, the other pink and plump, contemplate existential questions in Yellow & Pink (1984) by William Steig. (""I can't help wondering... how we got to be here. It all seems new and strange. Who are we?"") Steig's pen-and-inks, with occasional gray wash, are accented only with the titular tones. PW called it ""a comic fable that has more clout than the most fervent homily.""